Each year as the spring arrives, hundreds of millions, perhaps billions of people celebrate Chinese New Year. Its vibrant history and rich symbolism manifest in everything from dance to food. To help explain some of that history and meaning here are TOP 10 Chinese New Year Facts. The date for Chinese New Year, also known as the Spring Festival, is determined by the Lunar Calendar. Lunar months begin on the day of the dark moon, also called the new moon, and end on the day before the next dark moon; with each month lasting for 29 or 30 days. This means that in the Gregorian Calendar, the one most commonly used, the Chinese New Year falls on a different date each year, although it will always fall between January 21st and February 20th. According to Chinese Mythology, the beginning of the New Year started because of the Nian, a beast that lives under the sea or in the mountains, and that comes out of hiding around New Year to eat livestock, crops, and villagers…especially children. To protect themselves from the Nian, the villagers would prepare food and leave on their doorstep. It was believed that once the Nian ate all the food, it would leave the villagers alone. However one day, a villager was visited by a god who told the villager to cover his house with red paper and to place firecrackers in front of his house to scare the Nian; and it worked! From then on, right before the New Year, they decided to hang red lanterns, post springtime scrolls, and lite firecrackers in front of their houses. The Nian never came back, starting the first of many New Year’s traditions that we will examine. The Shengxiao, which literally mean “birth likeness”, is also known as the Chinese zodiac. Like western astrology, the cycle is divided into 12 parts, each ascribing personality traits and life events. However, the Chinese zodiac’s 12-part cycle corresponds to years and is represented by 12 animals. In order they are: the rat, the ox, the tiger, the rabbit, the dragon, the snake, the horse, the goat, the monkey, the rooster, the dog, and the pig. The order of the animals comes from a very old folk story: 13 animals were in a race to meet the Jade Emperor, who had decreed to name the years on the calendar based on the order the animals would finish the race. It’s a tale that shows the different personalities and the struggles they each faced to finish the race. The Rat proved to be the smartest one finishing by hiding in the ear of the ox, while the Pig got hungry during the race so he stopped to eat and take a nap finishing last…at the start of the race, there also was a Cat, but sadly it drowned trying to cross the river, and therefore, never made it in the zodiac. Chinese Astrology gets even more complex than what is commonly known in western culture. While you are assigned an animal based on the year you were born, there are also animal signs based on months (also known as inner animals), based on the days (also known as true animals) and based on the hours (also known as secret animals). Furthermore, in addition to the zodiac cycle of 12 animals, there is a 10-year cycle of Celestial Stems, which are associated with one of the five elements of Chinese Astrology: Wood, Fire, Earth, Metal and Water. Each element is rotated every two years, with each one of those two years being associated with either the yin or the yang. Combining all that up means that there’s a unique cycle that repeats every 60 years. 2018 is the year of the Dog. It is theorized that a person’s characteristics are decided by their birth year’s zodiac animal sign and element. So there are five types of Dogs, each with different characteristics: Wood Dog, Fire Dog, Earth Dog, and Gold Dog. Today, Chinese New Year is celebrated in many countries and cities around the world, predominantly those with a large Chinese population. The San Francisco Chinese New Year Festival and Parade is the largest event of its kind outside of Asia. The festivities include people marching down Grant and Kearny streets while carrying colorful flags, banners, lanterns, drums, and firecrackers. Other North American cities celebrating with a parade include Los Angeles, New York City, Boston, Wellington, Toronto, Vancouver and even smaller cities have started hosting celebrations. The London festivities include concerts and performances on Trafalgar Square that attract close to half a million people each year. 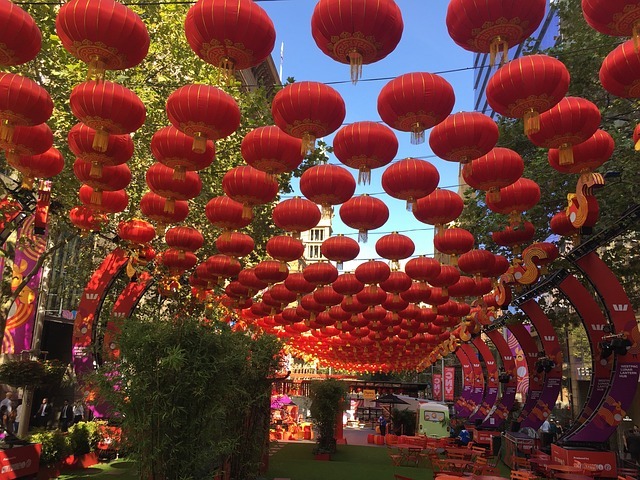 Sydney also celebrates the Chinese New Year with large appeal. The events there last for 3 weeks and they include outdoor markets, Chinese opera performances, dragonboat races, a film festival, and multiples parades attended by hundreds of thousands of people each year. Chinese New Year celebrations are deeply rooted in family and welcoming in the new year. Shared meals are deeply symbolic to both of these components and they are reflected in traditional food homophones, words that sound the same but have different meanings. Four Chinese New Year dishes are noodles, fish, dumplings, and sticky cake. First, Noodles are a quintessential Chinese food period. During the New Year, uncut noodles, the longer the better, represent longevity. Fish(魚), pronounced yú is a homophone for “surpluses”(餘yú), and is often eaten or just displayed and saved for the day after. If you head south towards Canton, the main Chinese new year dumpling is thought to resemble ancient Chinese gold ingots signifying wealth and prosperity. Finally there isn’t a better way to end a New Year’s meal than with some sweet Niangao, a popular eastern Chinese dessert which literally means sticky cake, but is pronunciation as “a more prosperous new year (年高 lit.Year high)”. These examples from around China are just a sample from a people who have a deep love for food and symbolic word play. The dragon and lion dances are two traditional Chinese dances that are commonly performed during celebrations including Chinese New Year. The dragon dance can be distinguished from the lion dance as dragon dancers are large teams of performers that are fully visible by the crowd. On the other hand, lion dancers operate in two dancer teams and the performers’ faces are only seen occasionally, since they are inside the lion costume. As classic Chinese symbols, dragons are believed to bring good luck, therefore the longer the dragon in the dance, the more luck it will bring to the community. The dance is performed by a team of dancers who manipulate a long flexible figure of a dragon using poles positioned at regular intervals along the length of the dragon. Some of its classic movements include: “Cloud Cave”, “Whirlpool”, T’ai chi pattern, “threading the money”, “”looking for pearl””, and “dragon encircling the pillar.” The movement “looking for pearl” is emblematic for the pursuit of wisdom. The Dragon dance also reflects agricultural roots can be seen in the movements for the river dragon deities. The Chinese lion dance has fundamental movements can be found in most Chinese martial arts. The two main forms of the Chinese lion dance are the Northern and Southern Lion dances, with many Southeast Asian countries adapting a form of the later. In Southern Chinese Lion Dancing, the lion consists of a head which is traditionally constructed using papier-mâché over a bamboo frame, and a body made of fabric trimmed with fur. The colors of the lion, particularly white, yellow, and black, are symbolic of the lion’s age but also refer to three historical characters recorded in the classic Romance of the Three Kingdoms. The Chinese Lion Dance is also performed accompanied by the beating of drums, cymbals, and gongs. While these dances have been described in depth, seeing them performed live is the best route to go. The Chinese New Year is often accompanied by loud, enthusiastic greetings, often referred to as 吉祥話 (jíxiánghùa) in Mandarin, loosely translated as auspicious words or phrases. The Chinese love for wordplay in auspicious phrases is often structured in New Year couplets, printed in gold letters on bright red paper. They probably predate the Ming Dynasty (1368–1644), but did not become widespread until then.Today, they are ubiquitous with Chinese New Year. These greetings or phrases may also be used before children can receive their red packets. Some examples include: “May your wealth [gold and jade] come to fill a hall”, – “May you realize your ambitions”, “Greet the New Year and encounter happiness”, “May all your wishes be fulfilled”, “May your happiness be in abundance”, “May you hear [in a letter] that all is well”, and finally “May your happiness and longevity be complete.” Children and teenagers sometimes jokingly use the phrase 恭喜發財,紅包拿來 “Congratulations and be prosperous, now give me my red envelope!” This is followed by a heavy beating unless you’re a really cute kid…just kidding. As previously mentioned, a classic Chinese New Year tradition is the giving and requesting of red envelopes, also known as “hong bao.” Hong bao are usually given out by married couples from the previous generation to single people, especially to children. The red color of the envelope symbolizes good luck and is supposed to ward off evil spirits. The practice is thought to have originated in the Qin Dynasty where the elderly would thread coins with a red string. The money was referred to as yāsuì qián (Chinese: 壓祟錢) or “money warding off evil spirits” and was believed to protect the person of younger generation from sickness and death. The yasui qian was replaced by red envelopes when printing presses became more common. Red envelopes continue to be referred to by such names today. As a last thought, during New Year it is traditional to put brand new notes inside red envelopes and also to avoid opening the envelopes in front of the relatives out of courtesy. Chunyun, or the spring festival, is also a period of travel in China with an extremely high traffic load around the time of the Chinese New Year. The number of passenger journeys during the Chunyun period has exceeded the population of China, hitting over 2 billion in 2006 and it has been called the largest annual human migration in the world. Three main factors are responsible: First, it is a long-held tradition for most Chinese people to reunite with their families during Chinese New Year. Since the Chinese economic reforms of the late 1970s, new economic opportunities have emerged, often at a considerable distance from people’s hometowns. This particular phenomena is given a human face in the 2009 film, “The Last Train Home” where it connects the migration with tech companies like Apple. Second, Chinese education reforms have increased the number of university students, who often study outside of their hometown. The Spring Festival holiday period falls around the same time frame as their winter break. Among the 194 million railway passengers of the 2006 Chunyun period were million university students. Finally, because the Spring Festival Period is one of the few week-long holiday periods in the People’s Republic of China, many people choose to travel for pleasure around this time. Tourism in mainland China is reaching record levels, further adding to the pressure on the transportation system.